If you are dreaming of paradise..I bet “no traffic” might be in that dream. No freeways, no congestion, no wasting valuable hours of life on asphalt. 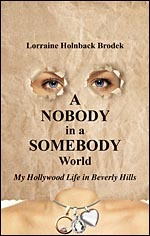 And most projects involve backstories. Such is the case for the cause of the stoplights. 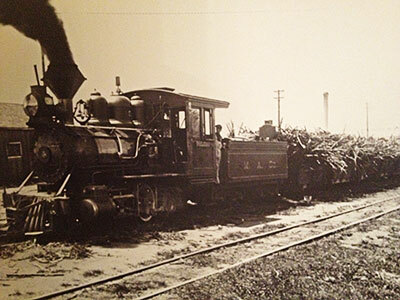 In the late 1800’s, Hana used to be a thriving hub of the sugar cane industry. 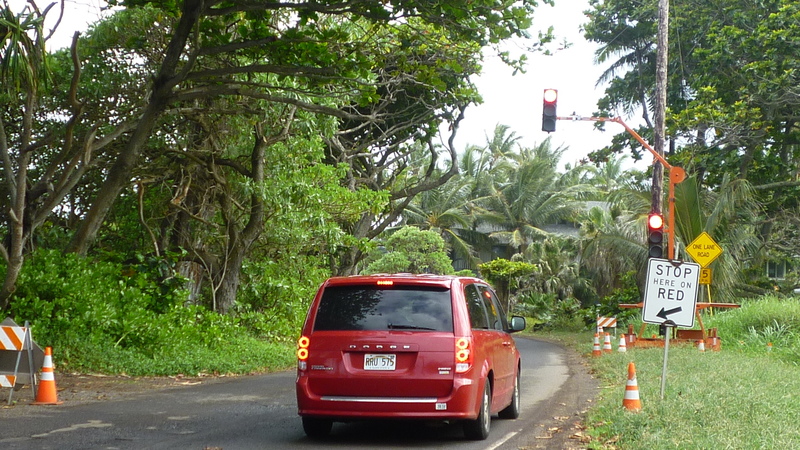 A train ran between our verdant hills and pasture lands delivering sugar cane to the mill on the “other side” of the island near Kahului (Ka-hoo-loo-ee). 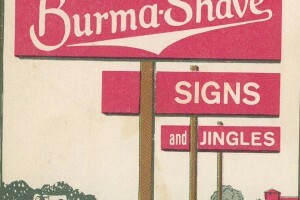 The Chinese provided a substantial portion of the work force. 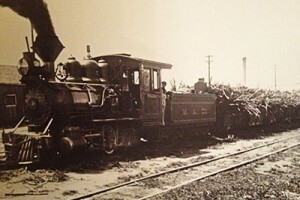 Consequently, the cane-train engineer was “pākē” (Hawaiian for Chinese). And legend has it that sākē (Japanese rice wine) kept him hydrated on his return trip to Hana after his long clickety-clack train track trip through the jungle. Getting closer to home, he rounded a 90-degree bend (probably going a wee bit wikiwiki (weekee-weekee as in fast) due to DUSI (driving under sākē impairment). As with most “Dead Man Curves,” the name lives in perpetuity and does not die as is usually the case with the driver–now deceased. 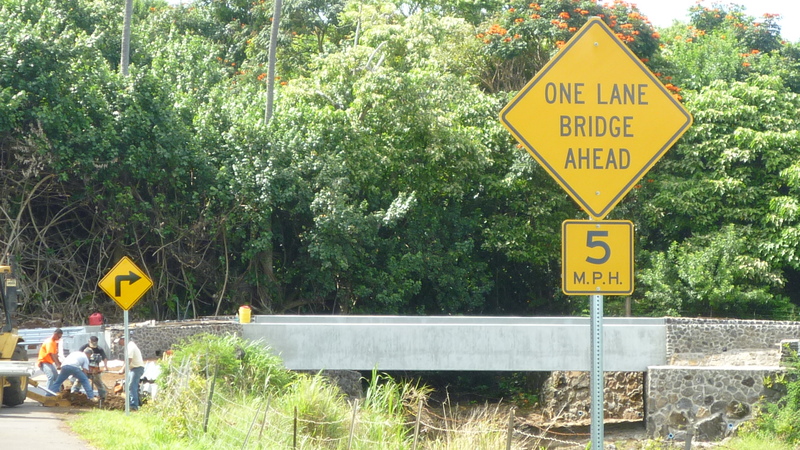 So for over 150 years years, this Hana bridge has been called “Mākē Man Bridge.” In Hawaiian, “Mākē” means dead. 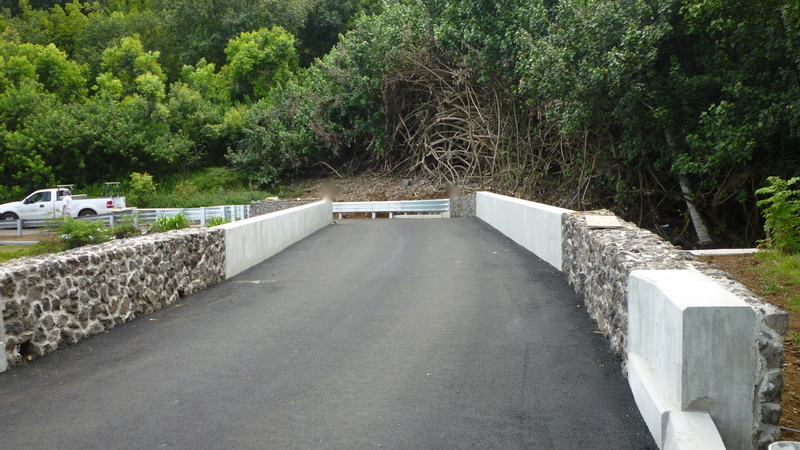 Through the years, there have been a few more “incidents” on Mākē Man Bridge including tumbling boulders in water rapids flowing underneath . Some of these banged into the support pilings holding up this span over the curve and it was determined that its strength was structurally weakened–as in–it could fall down with the next cement truck and/or fully loaded tour bus crossing over it. So what to do.. 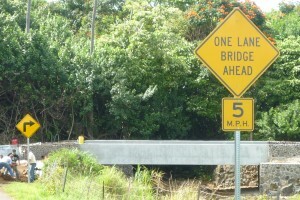 The bridge repairs needed to start–but first it needed to be torn down, meaning cutting off that portion of the Hana Highway. 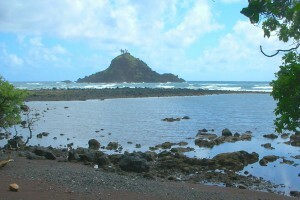 The county determined that they could create a detour down the quaint scenic road that meanders by beautiful Koki (Ko-key) Beach, magnificent Alau (allow) Island and Hamoa Beach which is #5 on Dr. Beach’s Top-10 Best Beach List for 2014 (www.drbeach.org). Trouble is this charming road is essentially a single lane in most parts, but it’s never been a problem for any of us. 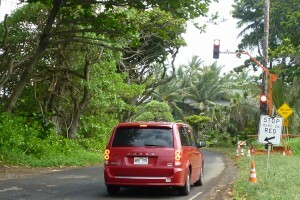 We just pull to the side being careful not to leave a fender in a lava rock wall when opposing traffic comes our way. And we just back up for school buses and monsta trucks. The county determined that with the increased traffic caused by the highway closure, that this little road needed traffic signals (!) 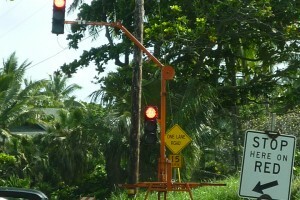 to prevent congestion and protect our safety in paradise. 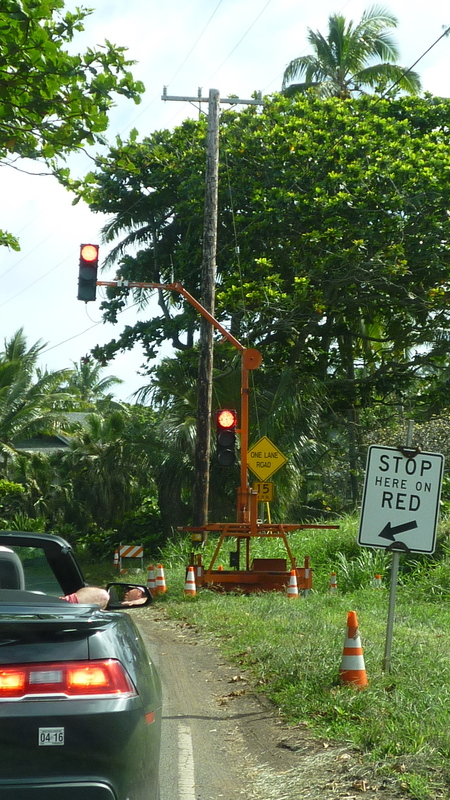 So about a half-mile stretch of asphalt is controlled by “never-before-in-Hana” traffic lights. 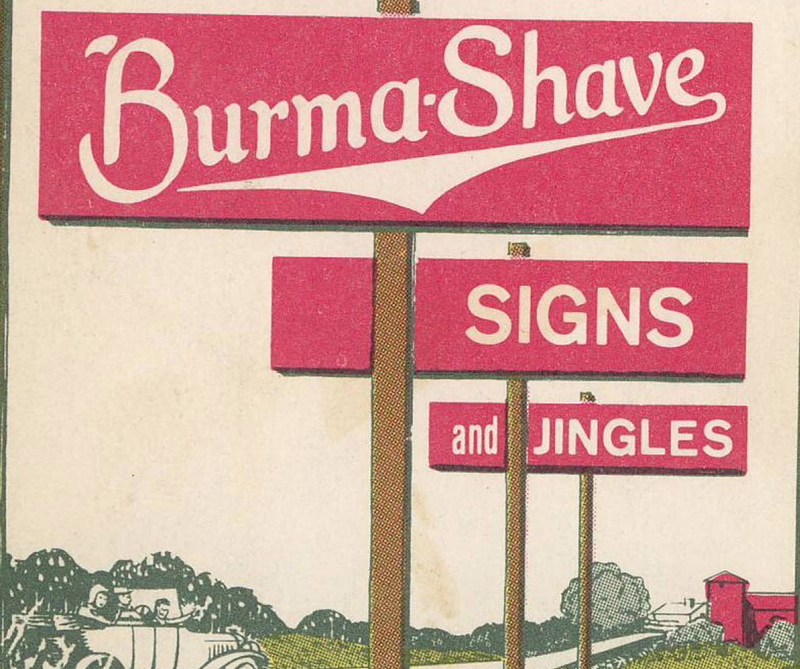 My own independent survey has determined that one never reaches the signals when they are green–meaning that you sit for seven minutes as you wait for opposing vehicles or vehicle to come through. This effort requires your inner Zen. Breathe in. Breathe out. Sit. Bring your ukulele. Strum and hum. 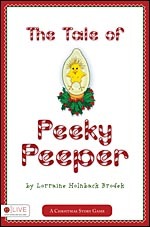 The man in the beat-up pick-up in front of me with the bumper sticker that said, “Patience–Jesus is coming back”–well, he must have borrowed that truck from the pastor because he sat for maybe 30 seconds and then ran the red. The “Barney Fife” cop was waiting just up the road behind the hibiscus and nabbed him. $97 fine. The other benefit of waiting is the scenery surrounding you that provides pure enjoyment. Most don’t realize what’s on the other side of those Kamani trees that you are stopped under. Look a little to the left and behind you and you can watch the ocean waves touch the shore as they splash in from Alau Island. Roll down your windows. Breathe the salt air and fragrance of the plumeria blossoms. Now that’s paradise. 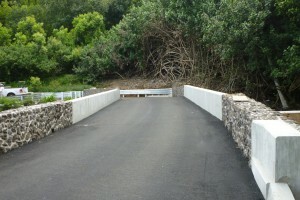 Saving good news for last: the mayor is coming to Hana on June 17th to officially open Mākē Man Bridge. Thanks to the great county road crew they redefined temporary into soonest. And the red-light district will soon be just a glowing memory.